Eco-innovation is vital for delivering the Europe 2020 Strategy objectives, as recalled by both the Resource Efficient Europe and the Innovation Union Flagship Initiatives. It is also key to delivering many aspects of the circular economy: industrial symbiosis or ecologies, cradle-to-cradle design and new, innovative business models. In this context and to accelerate its market uptake, an Eco-innovation Action Plan (EcoAP) addressing relevant barriers and drivers, was adopted by the European Commission in December 2011.
bring together public and private actors to promote breakthrough innovations with big market potential in key sectors that could contribute to greater resource efficiency. the Product Environmental Footprint pilot. Since its adoption, the EcoAP has been targeting innovative SMEs. In fact, it recognises innovative front-runner businesses with the European Business Awards for the Environment (EBAE), it opens up funding opportunities under COSME, Horizon 2020, and the LIFE programme and builds on the Enterprise Europe Network (EEN) for business matchmaking. Recently, EcoAP efforts have been strengthened by the Green Action Plan for SMEs. A thematic report on 'Emerging Markets' (by the EU Eco-Innovation Observatory), explores the role of European SMEs in promoting a green economy, not just ‘in house’ but also on a global scale. It analyses the challenges and opportunities for European eco-innovators that exist within the emerging markets in Asia, Africa and Latin America. The growing markets in these developing economies, along with the increasing recognition of the sustainability and environmental agendas in the countries in which these markets are based, have created and in several cases increased, demand for eco-innovations and eco-industrial technology and services. The particularly rich experience and knowledge of European eco-innovators and eco-industries have a lot to offer to these emerging markets. Through international collaboration, European eco-innovators can also assist developing countries in economic and technological leapfrogging and give added environmental value to the development process. 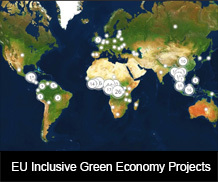 Moreover, the EU funded Eco-innovation Project, aiming at developing local and national technical capacities to strengthen sustainable practices in SMEs, builds on networks of Resource Efficient and Cleaner Production service providers and other business intermediaries, to assist SMEs in implementing eco-innovation. Implemented by UNEP, the project also provides technical guidance, through an Eco-innovation Manual with sector specific supplements and practical guidelines on mainstreaming Sustainable Consumption and Production Policy for Eco-innovation. the establishment of the INNOCAT network under the demonstration projects and partnerships action, bringing together public and private buyers to publish a series of tenders for eco-innovative catering products, services and solutions. the launch of the EU skills panorama, a website providing clear, reliable, open and relevant data and information, with a view to improving Europe’s capacity to assess and anticipate skill needs, thus contributing to education and training systems that are more responsive to labour market needs, and to matching better skill supply and demand across Europe. the INVESTMENT PLAN for Europe: a pipeline of EU projects with a focus on large infrastructure, research & innovation, employment and environmental sustainability.